Mount Amos, Wineglass Bay Circuit, Tasmania. 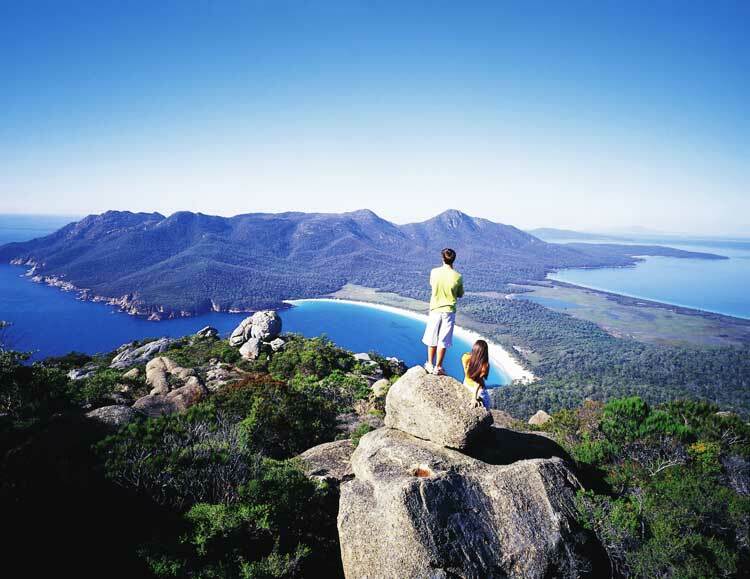 The fifth of our top ten Australian day walks, Wineglass Bay Circuit is the highlight of the East Coast of Tasmania. Most visitors to pinup-perfect Wineglass Bay walk no further than the lookout pinched between the granite peaks of the Hazards, granting them the classic view of this bay curved like a supermodel but denying them some of the finest coastal walking in the country. From the lookout a track descends across the Hazards’ curiously pink granite to Wineglass Bay, where another track crosses the isthmus to dune-backed Hazards Beach.Before switching beaches and returning north around the foot of the Hazards, take some time to wander and admire Wineglass Bay. Take more than a few steps along this Tassie icon and you’ll most likely have the place almost to yourself. On Tasmania’s east coast, around 200km from Hobart and Launceston. A pretty little place called Wineglass Bay – you may have heard of it. A fairly steep haul up to the lookout platform but comfortably flat thereafter. The track around Fleurieu Point, north of Hazards Beach, can be rocky and uneven, so care is required.